So kudma de ghar aayee! My bebe doesn?t remember the lines after this so she tells me..
“Te 'ho's are in chorus Sunder mundriye ho! Dullhe di dhee vyayae ho! Kudi da laal pathaka ho! Kudi da saalu paatta ho! Chache choori kutti! zamidara lutti! He gave 1 kg sugar! The girl is wearing a red suit! But her shawl is torn! Who will stitch her shawl?! He made the landlords eat a lot! The policeman hit him with a brick! 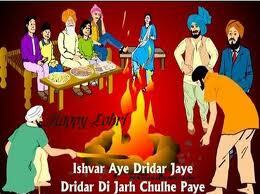 Give us lohri ..long live your jodi!"